Anolon Authority 16cm Milkpan ideal for warming milk and boiling eggs. 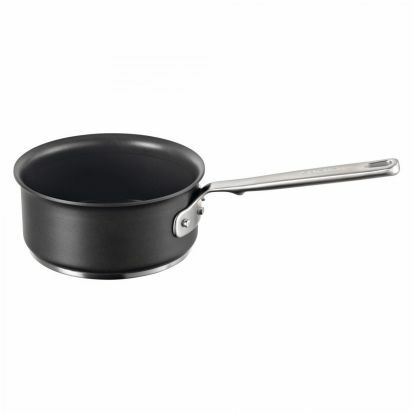 Anolon Authority hard anodized cookware offers durability and superior quality. Crafted from hard anodized aluminium ensuring this cookware range incorporates the best features possible. The anodizing process allows this material to be twice the strength of stainless steel, ensuring longevity and robust pans for years to come. Hard Anodised cookware also allows for a quick and even heating ensuring your food is cooked to perfection. Complete with Anolon's Surerest™ technology, the pans handle includes a 'notch' on the bottom to rest between your fingers allowing for a better grip as it stops your hand from slipping. The handle is also elevated, designed to take the weight. Including performance non-stick, this cookware ensures food does not stick and is simple to clean. Suitable for induction cookers and being dishwasher safe.